Virginia cops last week did their bit for caprine wellbeing by liberating a half-baked goat from a car trunk, the Lynchburg News Advance reports. Bedford Sheriff’s Deputy Allison Key was alerted to a possible goat in distress scenario when Fiona Ann Enderdy, 32, of Washington, DC, pulled up at a DUI checkpoint on US 460 at the Bedford County/Campbell County line. Key heard noises from the trunk and enquired just what Enderdy was carrying. The driver freely admitted "she had a goat", which proved correct when Key popped the trunk to find the bound animal "panting heavily". A police statement noted that an animal control officer clocked the trunk's temperature at "94 degrees after it had been opened for about 10 minutes". Enderdy explained she'd bought the animal to give to the four Kenyan passengers in her car. She defended her goat transportation technique on the grounds that she is British and "transporting goats in this manner is acceptable there". This evidently didn't cut much ice with the Virginia authorities, since Enderdy was "charged with cruelty to an animal". She'll face an advisement hearing on 8 July. 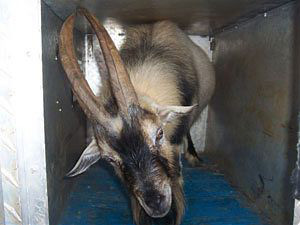 For the benefit of Brit readers intending to carry goats in their vehicles in the near future, our legal department is currently seeking clarification as to whether they can indeed ride in the boot, or must be securely strapped into a seat with a readily-available supply of fodder and water.